Whether I'm dressed up for a night out or keeping it casual and comfy, I want to look stunning when I head out the door. A simple touch of jewelry is usually all my outfit needs to be taken to the next level. Check out how my favorite styles in jewelry can not only add ravishing ferocity to your style - but also your attitude. For centuries, people have believed agate stones to be incredibly grounding. Not only are they very beautiful and durable, but they are said to bring stability and balance during times of change. 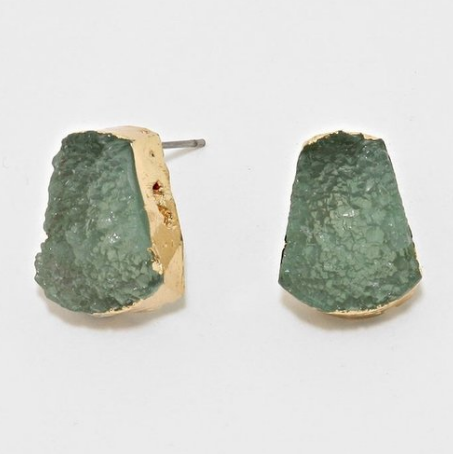 The Agate Stone Drop Earrings come in frosty green, raw cuts to add a dash of strength and natural beauty to your style. With glamorously imperfect golden edges, the agate stone earrings nicely adorn any elegant style. The classy White Howlite stone traditionally helped let go of stress and worry. Live and let live with our White Howlite Ring that features an eye-catching stone that's naturally marbled and opulent without stealing the show. It exquisitely punctuates shades of white in your outfit. Historically, the Onyx stone was believed to help direct one's energy and focus on their goals. The Black Onyx Ring is the ideal statement ring. It features an alluring shade of black that adds intense beauty and mystery to a sensuous dress. Rose quartz is classically believed to be the stone of love and heart healing. If you wish to strengthen love in your life plus add feminine grace to your style, then the Rose Quartz Ring is for you. The gentle shade of pink lends such a subtle touch of beauty to casual styles, that your love won't know what hit him. Quartz stones are thought to amplify one's intentions and the qualities of other stones worn. A beautiful teal toned quartz is calming and feminine, with a touch of sophistication. Our elegant Teal Quartz Crystal Semi Precious Stone Necklace features a delicate, rectangular cut and marbled tone. This striking beauty adds allure to any outfit. Silver has been believed to enhance health for centuries. The benefits of silver are said to come from its positively-charged ions that reflect electromagnetic radiation away from the body. This helps the body maintain balance, circulation, temperature, and overall well-being. Sounds crazy? Well, this study found that wearing silver rings help alleviate symptoms of arthritis. So if you're going to wear silver for its benefits, do it with style! The Sterling Silver Roman Style Bracelet features a classical design of delicately linked, brilliant crystals. You will bedazzle like a goddess when you wear this exquisite sterling silver bracelet.